Jack Vaughn’s old friend Cal has gone missing. His vintage Cadillac has been pulled out of a South Florida canal. His house is suddenly up for sale. His gym has been appropriated by a gang of Russian thugs. Vaughn suspects foul play. The fictional ex-cop goes in search of his friend, hoping to find him alive. And that is where Vaughn’s story was about to end. Photo courtesy of MidTown Publishing. Jack Vaughn is the creation of FIU alumnus Anthony Gagliano, who earned his Master of Fine Arts degree in Creative Writing in 2002. The search for Cal was Gagliano’s second crime novel featuring Jack Vaughn. 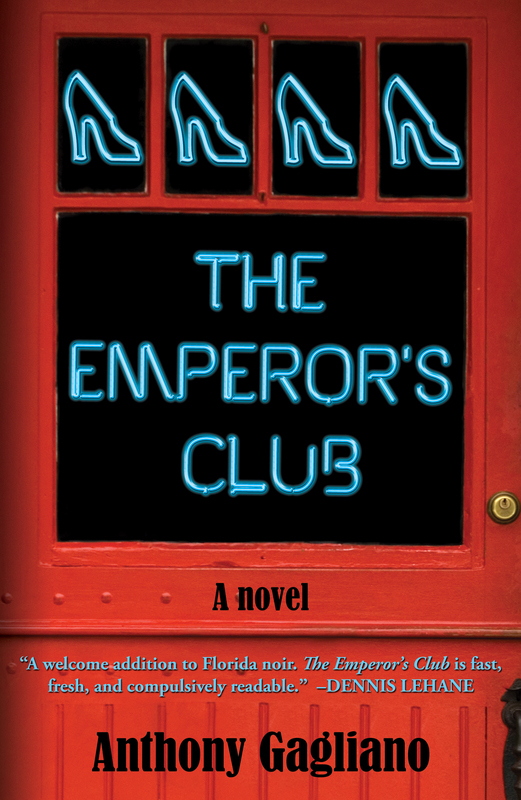 Gagliano titled the book The Emperor’s Club. But in 2009, midway through his manuscript, Gagliano suffered a stroke. He died shortly after at the age of 53. The plight of Vaughn and his missing friend Cal were resigned to the fate of a book not yet finished. Gagliano’s first book, Straits of Fortune, was critically acclaimed. His former professors, Les Standiford and Dan Wakefield, were fans. So when their former student unexpectedly passed away, they were disappointed to know his next novel would never see the light of the day. But because he couldn’t, Wakefield and Standiford decided they would keep Vaughn going — at least until the story ends in The Emperor’s Club. So they contacted Gagliano’s widow and asked for the incomplete manuscript. She dug it up from his computer and sent it to the professors. They got to work. There are many challenges in finishing another person’s creative work, especially when you don’t know how the story was supposed to end. Maintaining another author’s cadence and the voice of their characters is tricky. And making sense of unfinished chapters can be downright confusing. “I’d be reading along and I’d say, ‘Wait, didn’t this just happen?,’” Standiford said. It was in that moment Standiford realized Gagliano would move around pieces of the plot to find the best fit within the storyline. Old stuff would sometimes be inserted in the middle of new stuff. It was clear the intent was to reconcile these replicated storylines in the final draft. With Standiford gaining clarity of Gagliano’s organizational style, he was able to reconcile the incomplete storylines. He sorted out the old from the new, inserting transitions as he went. Standiford and Wakefield passed the manuscript back-and-forth, collaborating throughout the process. “It was challenging but not impossible,” Standiford said. While Standiford did a lot of the heavy lifting, it was up to Wakefield to decide how the book ends. He was tasked with writing the final chapter. Once the manuscript was completed, Standiford called on his colleague at FIU, John Dufresne, to serve as editor. “I was a fan the first time I read it,” Dufresne said. He gave the book a second read for editing and to ensure it was ready for publication. Satisfied, the trio went in search of a publisher. Three years went by with nothing. The crime novel was facing a major challenge. Typically, publishers expect authors of mystery and suspense thrillers to create a series out of their lead characters. The Emperor’s Club was the second book to follow fictional ex-cop Jack Vaughn. It would also be the last. “Publishers look at what it will be like at the end of 10 books in somebody’s career. Not a single book,” Standiford said. Undeterred, Dufresne turned to a friend and colleague at MidTown Publishing in New York. With a single phone call, they found their publisher. The Emperor’s Club hit bookshelves this month. Gagliano’s widow has arranged to donate proceeds from the book to the FIU Creative Writing Program in her late husband’s name.